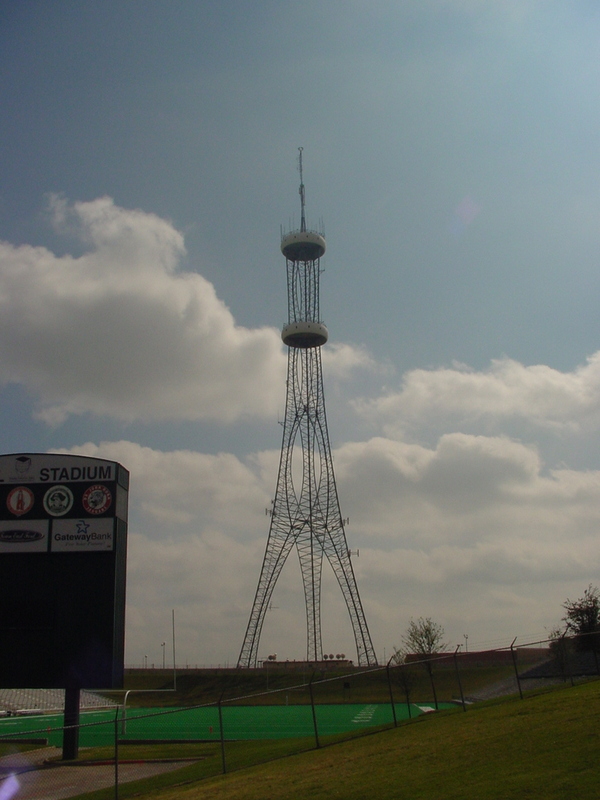 This tower—next to a high-school football stadium bigger than some NCAA Division I colleges'—is the home to the country's most powerful high-school station, KEOM (88.5 Mesquite). The station's studios (which we visited but I did not photograph) are every bit as modern-looking as this tower, which was built in the early '90s as a part of the station's upgrade from class A to class C1. The tower itself is owned jointly by the City of Mesquite and the Mesquite Independent School District, which split leasing revenues from the other tenants. According to the station's director, the two million dollars of construction bonds were paid off from leasing revenue alone in seven years. The school district's share now helps to subsidize KEOM's operation. KEOM runs a tight '70s oldies format, designed to simultaneously train students to jock a format they don't even remotely relate to, while reaching parents in the district with school-related news and announcements. The station is automated during periods when no students are available. This tower was designed by the same firm as built Cincinnati's “Star Tower”.